Iridium is transition metal in the platinum family which naturally occurs in alloys with platinum and osmium. 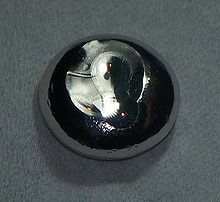 It is the most corrosion resistant element and competes with osmium for the title of most dense element. Iridium is used in the production of crucibles used to grow crystals to manufacture light-emitting diodes. Total demand for iridium was 334,000 ounces in 2010, up from 81,000 ounces in 2009. 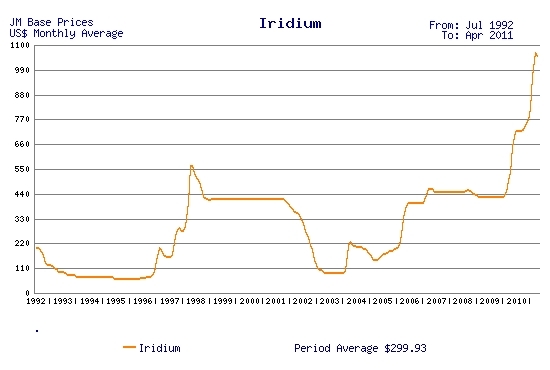 The price of iridium increased from $425 per ounce at the end of 2008 to $780 per ounce at the end of 2010. In May 2011, the iridium price reached $1050 per ounce. Norilsk Nickel (OTC: NILSY) - http://www.nornik.ru/en/production/products_type/31/ - produces iridium ingots and iridium powder. 2011-05-18 - (mm) - Iridium's price skyrocketing - what does it mean?